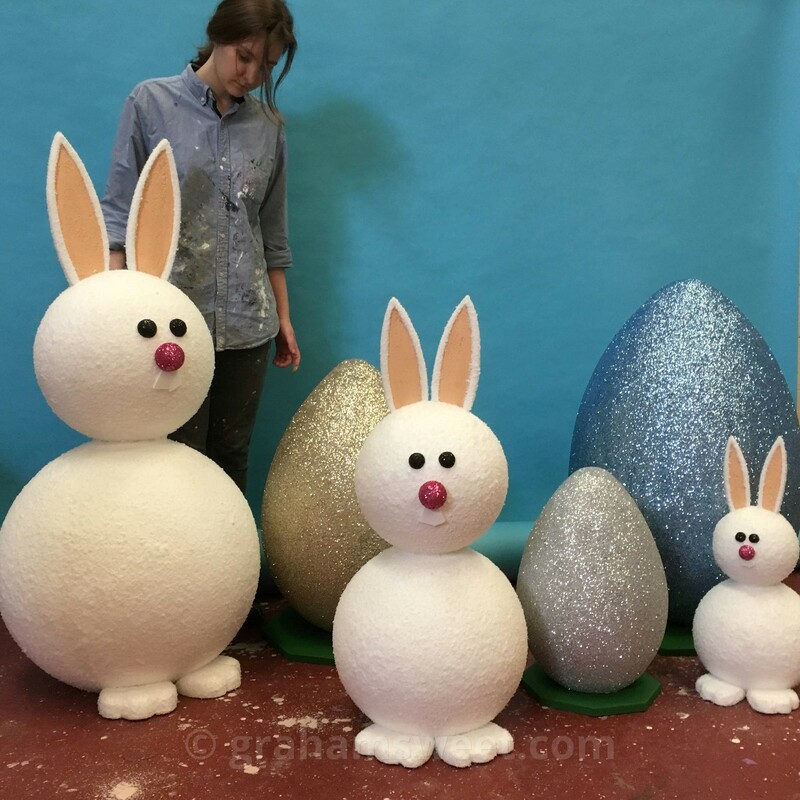 Easter Display props for shops, events and activities. 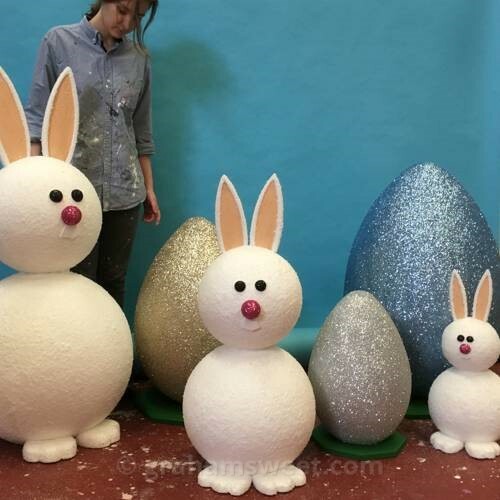 Giant Easter eggs etc..
We produce a wide range of Easter themed props and decorations, ranging from large decorated eggs to painted polystyrene flowers. 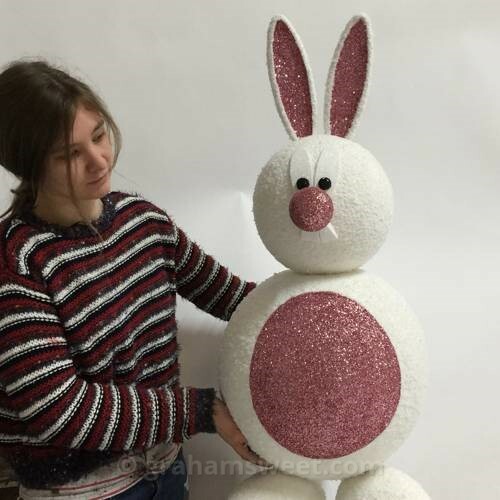 They are perfect for Easter themed window displays, events and organised activities. 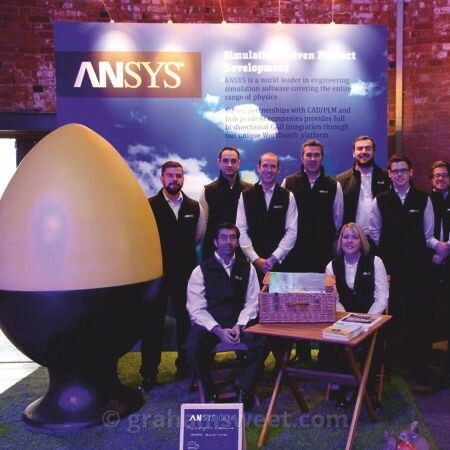 Our decorated eggs are very versatile and can be used for a number of Easter related activities such as Easter eggs trails, indoor events and parties. They can be placed on the ground, or we can add hanging points so that they can be hung from above. We also supply a range of VM display shelves which can be produced in a variety of sizes and decorated to suit any theme or decoration. Our polystyrene eggs range in size from 50mm to an enormous 1500mm and larger! They are great for Easter egg hunts and other Easter related activities and events. 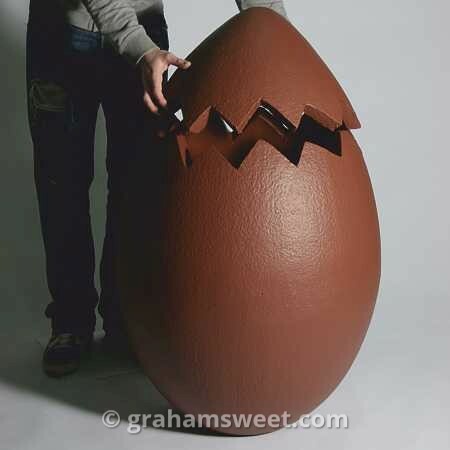 The eggs can be hollowed if required, or they can be supplied in one or two solid pieces. The eggs can be decorated to suit any theme or event. They look great covered in glitter or painted, and if needed, we can decorate them with a particular pattern or logo that is suited to you. If the eggs are to be hung, we can fix secure hanging points to ensure they hang safely while decorating your event. For more prices and more information on these decorated eggs, please give the studio a call on 029 20 522 510 to speak to a member of our team. Plain white polystyrene eggs are available in our online store. 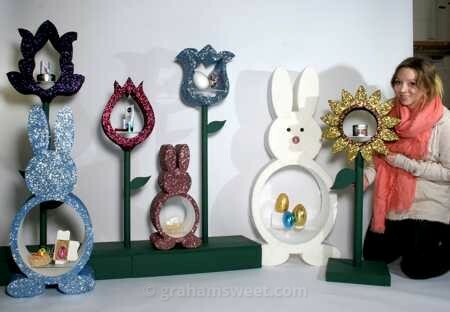 3d Bunny rabbits in a range of sizes and styles. 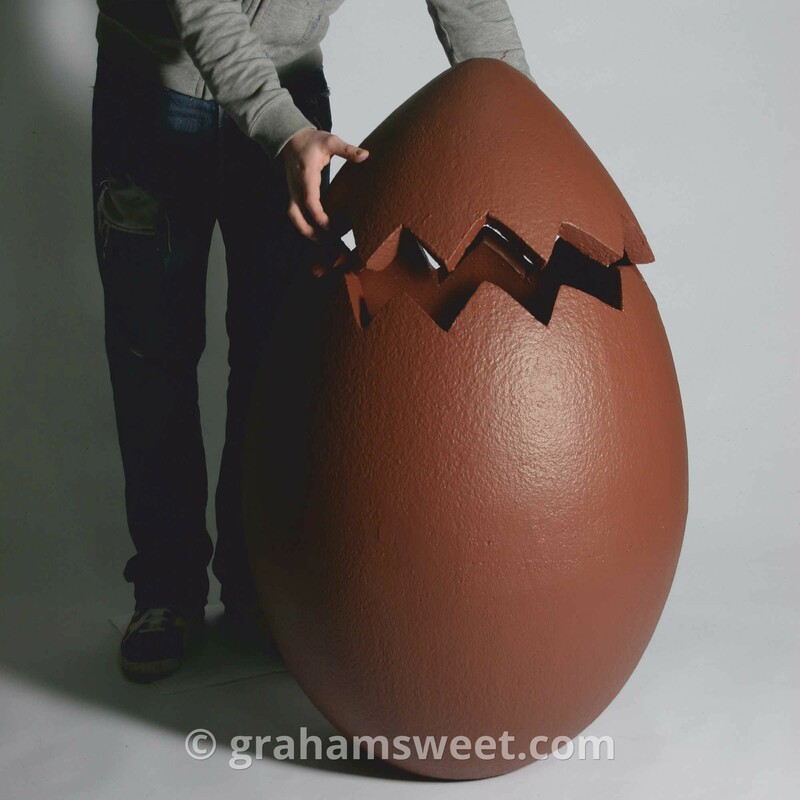 Great for easter window displays and events. Polystyrene 2d and 3d balloons, polystyrene clouds and poly flowers. 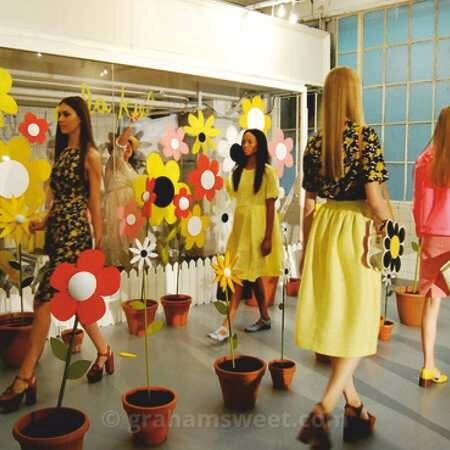 Ideal for spring / summer window displays and event theming. All available in plain, painted or glitter finish. All our summer props are designed and manufactured in our studios in the UK. We can produce these items to order, so stock is never an issue and turnaround times are normally quick. 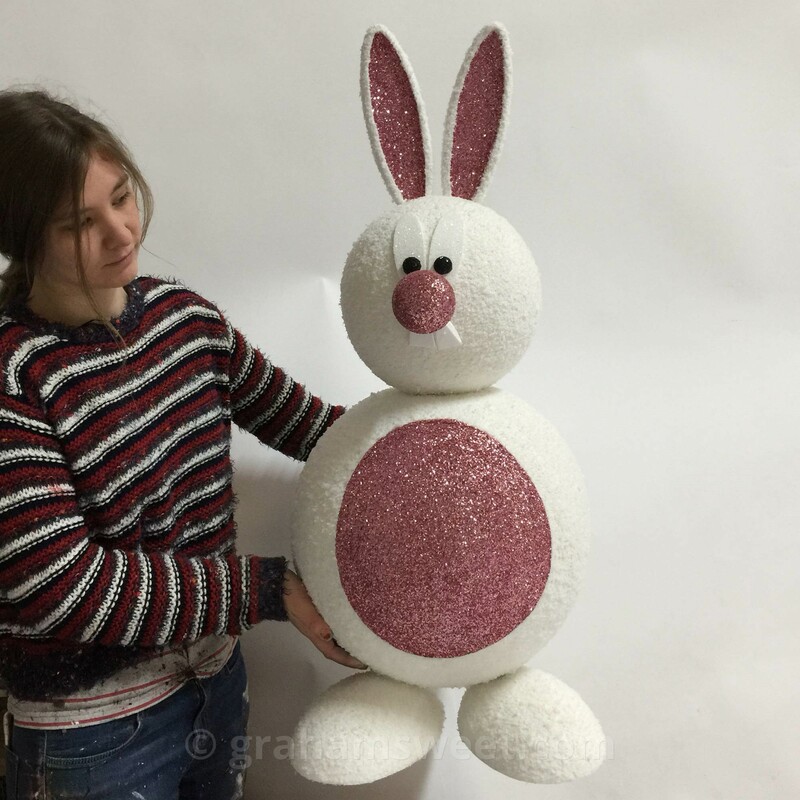 We use good quality display grade expanded polystyrene, and dont use flammable adhesives when applying glitter. These stylish shelves are perfect to display small merchandise such as perfume bottles and jewellery. They are available in a range of sizes, and the flower heads can be decorated in coloured glitter to suit any theme. These units are brand new to our display range, so please give us a call for more information and prices. 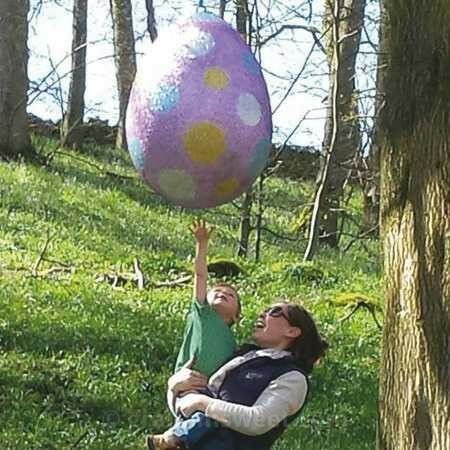 Our decorated eggs are very versatile and can be used as props for a number of Easter themed egg hunts and trails. They look great hanging from above as well as used on the ground to decorate your space or event. 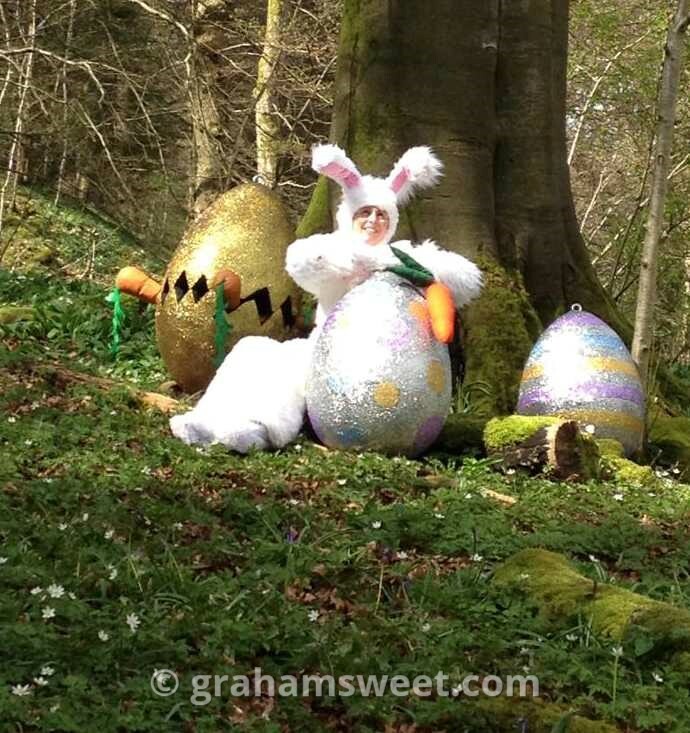 If you’re looking to create an impact with your Easter egg trail, why not hang our eggs from the trees and include some rabbits to complete your Easter scene. 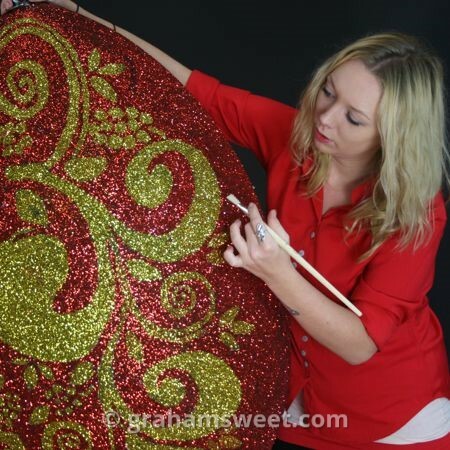 The eggs can be decorated in a variety of coloured glitters to suit your theme, and if you intend to use them outside, we are able to coat the eggs so that they are suitable for this purpose. 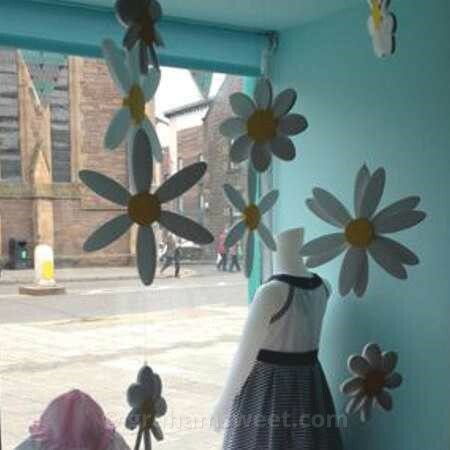 If you are looking to create an Easter themed retail / window display, our decorated eggs, flowers and bunny figures are great to transform your window. Available in a range of sizes and colours, the eggs can be hung from above, or can be assembled in clusters in the window bay. To complete the Easter scheme, our new rabbit shelves are perfect to display small merchandise as well as being a decorative item on their own. We also produce polystyrene flowers which look great either in pots or hanging inside your window. 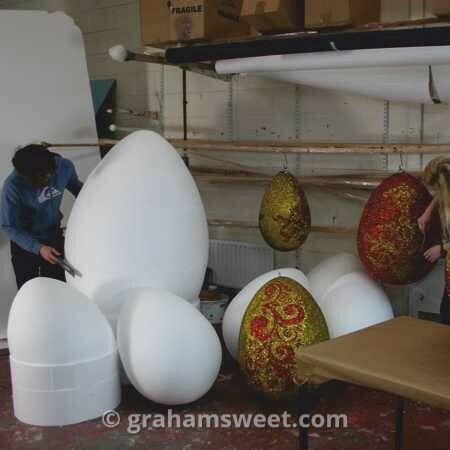 Giant Easter eggs are perfect for use in pantomimes, TV shows and on stage events. They will create an impact and can either used to form a backdrop or used as a main prop. 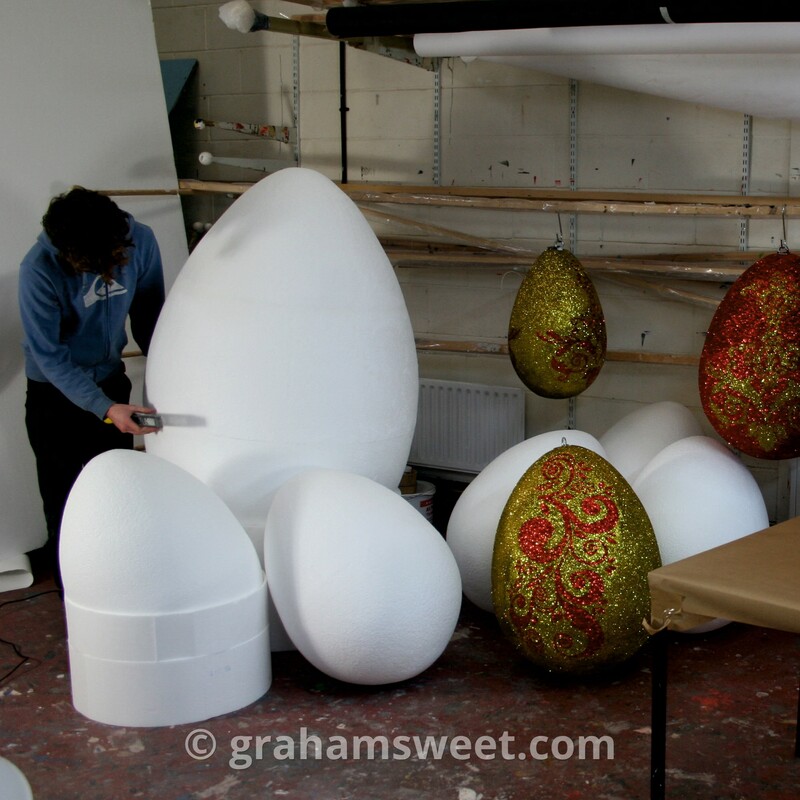 The eggs can be glittered plain, or decorated in a pattern to suit the theme of the production. In addition to our Easter themed props and decorations, we are also able to create more bespoke items on request. Produced form expanded polystyrene, they are light and easy to handle. 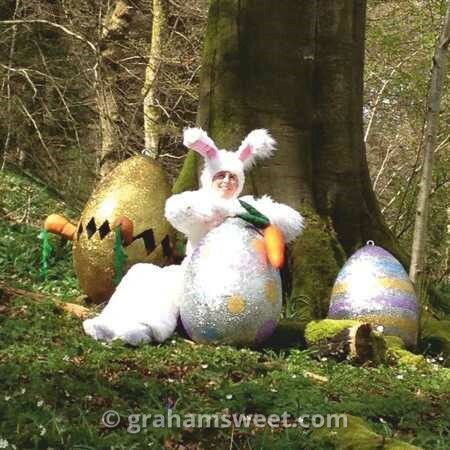 Our Easter products can be used for themed photo shoots, from retail advertisements to children’s Easter themed photos. 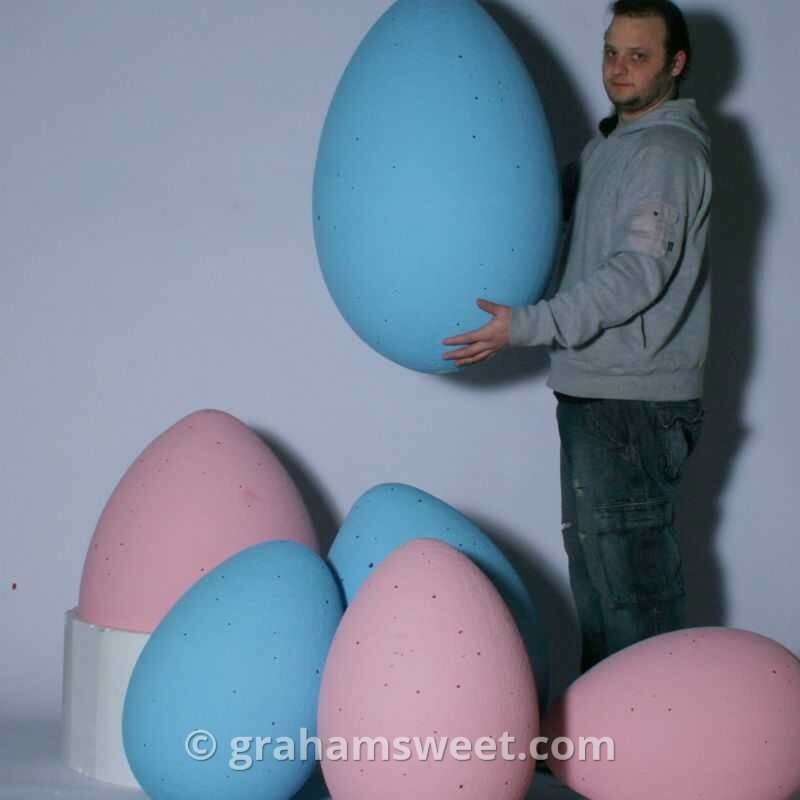 Our large pattered eggs are perfect to create an Easter scene, whether they are used in the background or in the forefront of the photo shoot.